UNITED NATIONS, July 25 -- While outgoing UN Peacekeeping chief Alain Le Roy was being toasted by Secretary General Ban Ki-moon at a Monday night reception thrown by French ambassador Gerard Araud, across town two separate ambassadors confirmed Inner City Press' July 5 story naming Le Roy's successor: Jerome Bonnafont. That Bonnafont is also French, when France is hardly a major troop contributing country, has been more and more noticed by other member states of the UN. “Does France own DPKO?” one Permanant Representative asked. The answer appears to be yes. When Ban Ki-moon became Secretary General he spoke of reform and meritocracy. But posts like that atop the Department of Peacekeeping Operations are held for particular states, seemingly without regard to the job experience of the person they put forward. What are Bonnafont's military credentials? Who in the UN system is reviewing them? 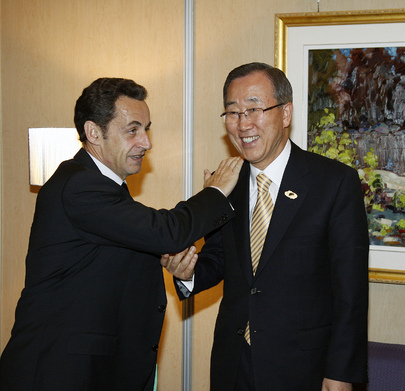 There are questions not only for the French, but for Ban Ki-moon and others. Watch this site. UNITED NATIONS, July 5 -- On the day France was questioned in the Security Council about arguably violating Council resolutions 1970 and 1973 in Libya, the name of a French diplomat to replace Alain Le Roy as head of UN Peacekeeping was leaked to Inner City Press: Jerome Bonnafont. Weeks before Le Roy announced he will leave on or before August 23, Inner City Press reported that he would leave. At the time, the favorite to replace him was Eric Chevalier, an aide to Bernard Kouchner in Kosovo. Some pointed out riffs between Kouchner and President Sarkozy, and Chevalier's lack of military experience. One senior UN official said of Chevalier, “It would be a disaster.” For that reason or not, well placed sources in the UN North Lawn building say the new name is Jerome Bonnafont. Bonnafont has served most recently as French Ambassador to India, and before that as Spokesman to to President of the French Republic. Like Chevalier, he has no visible military experience. While in India, he puffed up France's involvement in Afghanistan. He has paraded at Men's Fashion Week in New Delhi on September 11, 2009. The sources describe Bonnafont as an “order taker.” But from where? Watch this site. There is a UN Security Council arms embargo on Libya, on all sides of the conflict. Inner City Press on Tuesday morning outside the Council asked the chairman of the Libya Sanctions committee, Portugal's Permanent Representative Cabral, if there has been any move to consider if France's admitted actions violated the embargo. “We are expecting the Russians to raise it today,” Cabral told Inner City Press before going back into the Council for a closed door meeting, initially on July's program of work under the new German presidency. Since France's admission, Gaddafi's forces say they have intercepted weapons from Qatar meant for the rebels. With Qatar having just acquired the Presidency of the UN General Assembly, among other posts and events, things could get interesting. Watch this site. Update of 11:52 am -- after the consultations broke up, Western sources said that French ambassador Gerard Araud argued at length why dropped arms into Libya is “notwithstanding” legal, and claimed there was little opposition. The Russian delegation told Inner City Press “we cannot agree,” and said they asked Libya sanctions chair Cabral to convene a meeting of the committee. Cabral himself told Inner City Press that no meeting has been scheduled and he doubts that one will before UN part time envoy Al Khatib comes to brief the Security Council on July 11. We'll see. So even a meeting of the Sanctions Committee on this issue was blocked? July 11 will be al Khatib.